Plans to raze the Communications Building on Manchester College campus brings a bit of the history of this building to mind. It was built in 1915 as the Science building and included domestic science (Home Ec) physics and biology with laboratories, a room for art and the College Museum. There are also laboratories for chemistry and space for the study of agriculture. The building was used by these departments until about 1920. 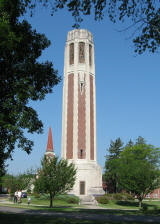 In 1908 the Indiana State Teacher Training Board demanded that the College open an elementary school on their campus if it was to continue to have a state approved program of training teachers. So the College formed a model training school under the supervision of the town's superintendent of schools. It was held in Bumgerdner Hall (present day east end of Ad) and was held for 48 weeks out of the year in order that College Normal School students could observe elementary classes being taught by certified teachers even during the summer months when many teachers enrolled for study. 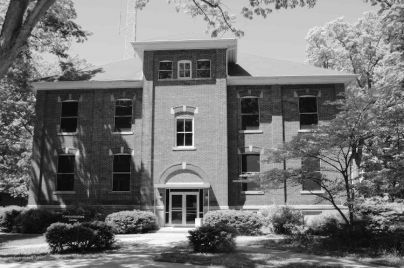 During 1920 construction was undertaken to connect the 1889 Bumgerdner Hall and the Bible building west of it to form one building for classes and administration. The September 2 North Manchester News said the elementary classes and the College Academy were to be moved into Science Hall. (The College Academy offered high school level classes) The chemistry department continued to have classes in the basement of Science Hall, the elementary classes met on the second floor and the Academy occupired the third and fourth floors. A playground with a slide and swings was on the north side of the building. One room was also designated as the music room. As needs of the College expanded there was increasing demand for space. The building became the home of the library in 1925 but it was not until 1929 that the new Thomas Marshall school gave space for all former North Ward (and Central school) elementary students. The College continued use of the town schools for observation and practice teaching and paid money each year to the schools for that service for a number of years. The library could expand its use of the building and was housed there until the new library building was built in 1966. The museum also remained in the building until it was closed much later. Major renovation was done after the library moved out and then the building was dedicated as the Communications Center at Homecoming, October 21, 1967. As such it included the radio station, two rooms for viewing films by classes and classrooms for communication, speech and drama and offices for Faculty related to these departments. Later the building was altered to make it accessible at the lower level and some classes met there from other departments. Now the museum has been closed and other space will be found for other departments so we must say farewell to a building which has served the College and the community well. Rest in peace.